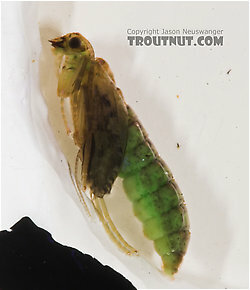 The large free-living larvae of the Rhyacophila genus are among the best-known caddisflies, and for good reason, because their unique biology is both interesting to entomologists and compatible with trout fishing. There are over 100 species, and many of them can be important. The pupae swim quickly up through the riffles and emerge on the surface. The females dive or crawl underwater to oviposit. When they're done they let go and dead-drift (Dead-drift: The manner in which a fly drifts on the water when not moving by itself or by the influence of a line. Trout often prefer dead-drifting prey and imitating the dead-drift in tricky currents is a major challenge of fly fishing. ), floating slowly to the surface. Diet: For most species, other aquatic insects. 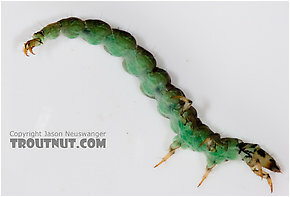 Rhyacophila larvae are large, usually green, and always plump, and they don't build cases or nets. They roam freely about the fast water and they often drift loose, where they are a good food for trout. 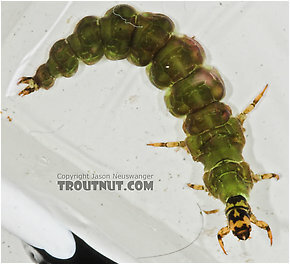 Many of these larvae have no gills at all and rely on absorbing oxygen from the water through their skin. Only cold water and fast flows can meet these needs, so Rhyacophila caddisflies love the same habitat as trout. The larvae may rappel between the rocks on a line of brown silk they secrete. This can be imitated by coloring the last foot or so of one's leader with a brown marker. A good imitaiton of a Rhyacophila larva is going to catch a lot of trout in swift, bouncing stretches of stream. The same fly is going to do poorly in slow areas of the same stream. A fly fisherman can avoid wasting time in the wrong sections of a stream by working leap-frog fashion instead of in a straight line. If he is using an imitaiton of a fast-water insect he should fish only the swift, broken currents, skipping past the slower current areas. Likewise, if he is using an imitation of a slow-water insect he should only cover the quieter pools and flats. He was speaking about fishing Rhyacophila imitations, but the advice is equally applicable to many aquatic insects. He cautions against using these imitations where the real insects are not abundant in the drift, because they are otherwise too large and bright to seem realistic. Rhyacophila fuscula (Green Sedge) Caddisfly Larva View 11 PicturesI collected this larva and several like it from the same stream and on the same day as this pupa. I suspect they're the same species.